Back in the early 2000s, Johnny Knoxville gained fame as the lead castmember on the stunt-based comedy show Jackass. Though 2018’s Action Point tells a narrative, it hearkens back to Knoxville's slapstick origins. Set in the late 19070s, Deshawn Crious "DC" Carver (Knoxville) owns and operates Action Point, a decidedly low-rent amusement park. He encounters trouble when 7 Parks, a larger, better funded attraction, opens nearby and threatens to put DC out of business. An even more direct problem arises when real estate developer Greg Knoblach (Dan Bakkedahl) wants to acquire the land on which Action Point sits. DC needs to get Action Point back on top to avoid this hostile takeover. For a few years there, Knoxville threatened to develop a mainstream acting career that left behind the injuries and mayhem of his Jackass days. This didn’t work out especially well, as Knoxville’s biggest hit – 2005’s Dukes of Hazzard - only mustered $80 million, a total that left it as a commercial disappointment. Now pushing 50, Knoxville seems a little old for the juvenile shenanigans of his Jackass days, and apparently audiences don’t find much appeal in this material. Action Point earned a pathetic $5 million, a figure that means even with a low $19 million budget, it lost money. Congratulations to moviegoers, as they made the right choice. Incoherent and idiotic, Point lacks even the most basic entertainment value. Essentially an homage to “snobs vs. slobs” comedies like Meatballs and Caddyshack, Point comes with the loosest of plots. Sure, it packs in a slew of story elements – issues with the park, DC’s relationship with teen daughter Boogie (Eleanor Worthington-Cox), etc. – none of it adds up to anything. Really, the film’s “plot” exists just as an excuse for a slew of slapstick gags and crude sequences. The movie feels like an episode of Jackass with a vague narrative attached, and it doesn’t work. That’s because Point feels like too much of a compromise. It lacks the wit and story heft it needs to satisfy a “general audience”, and it doesn’t go crazy enough with its stunts to fit the Jackass crowd. I guess we’re supposed to find the characters to be charmingly rough-hewn but they’re more obnoxious and creepy. They’re vague stereotypes without anything to make them likable or engaging, so we never invest in them or root for their success. Point also shows misplaced nostalgia for its era. Granted, I agree that society circa 2018 obsesses too much over attempts to make everything “safe”, especially related to kids, as they lack opportunities to experience life on their own terms. However, Point goes too far in the other direction and confuses recklessness for freedom. There’s a happy medium between the hermetically sealed lives of kids in 2018 vs. the dangerous idiocy espoused here. Even without flawed stabs at various themes, Action Point simply fails to provide entertainment. A collection of bad stunts and gross-out jokes, the movie flops. Footnote: outtakes accompany the end credits, and a brief tag appears at this scroll’s conclusion. Action Point appears in an aspect ratio of approximately 2.35:1 on this Blu-ray Disc. This turned into a strong presentation. Sharpness looked good. Only a little softness materialized in some wider shots, so the image remained accurate and concise. In terms of colors, Point tended to stay with a light teal and amber palette. Within those constraints, the colors appeared pretty clear and concise. Blacks were deep and firm, while shadows showed good delineation. Overall, this was a pleasing presentation. I thought that the DTS-HD MA 7.1 soundtrack of Point seemed fine but it didn’t excel because of a lack of tremendous ambition. Like most comedies, the movie featured a limited soundfield that strongly favored the forward channels. The mix showed nice stereo spread to the music as well as some general ambience from the sides and rears. A few ride-related scenes boasted superior involvement, and general atmosphere felt pretty good. However, this stayed a largely limited soundscape. Music was perfectly fine, as the score and songs showed positive dimensionality. This track was good enough for a “B“ but didn’t particularly impress. Four featurettes follow, and we start with Benny and the Sh*tbirds. It goes for seven minutes, 22 seconds and presents comments from actors Dan Bakkedahl, Brigette Lundy-Paine, Johnny Pemberton, Chris Pontius, Conner McVicker, Joshua Hoover, Eric Manaka, and Eleanor Worthington-Cox. “Benny” looks at supporting cast and characters. It manages to be almost totally content-free, as those involved joke around and tell us how awesome their experience on the set was. Next comes Anarchy in the Amusement Park, a four-minute, 12-second reel with Lundy-Paine, Worthington-Cox, producer Bill Gerber, executive producer Jon Kuyper, director Tim Kirkby, production designer Jules Cook, and actor Johnny Knoxville. “Anarchy” tells us about sets, locations and production design. It provides a few good nuggets but it’s too short to offer much. During the five-minute, four-second Old School, Bone-Crunching Stunts, we hear from Knoxville, Gerber, Lundy-Paine, Kuyper, Bakkedahl, and stunt coordinator Charles Grisham. As expected, this show covers the movie’s stunts. Like “Anarchy”, it comes with some useful material but it lacks depth. Drinking Beer with Grizzly Bears takes up four minutes, 37 seconds with comments from Lundy-Paine, Knoxville, McVicker, Hoover, Pontius, Knoxville, Manaka, and Worthington-Cox. “Beer” examines the animals who appear in the film. It becomes another mediocre reel. A collection of Bloopers lasts two minutes. It mixes stunts gone wrong with acting goofs. It’s not entertaining, but at least it’s short. Nine Deleted/Extended Scenes occupy a total of 12 minutes, 13 seconds. We get a long segment in which DC’s crew defaces a billboard, and we find more related to DC and Boogie. In theory, those DC/Boogie bits add some depth, but they don’t really expand much beyond what we already know from the final film. The stabs at comedy fail to amuse. A second disc offers a DVD copy of Point. It lacks all of the Blu-ray’s extras. How does one judge a movie that believes radical self-injury offers a good way to “stick it to the man”? 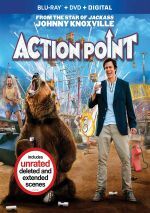 Action Point suffers from a mix of misguided themes and it also simply fails to provide any form of amusement or entertainment. The Blu-ray brings pretty good pocture and audio as well as spotty supplements. 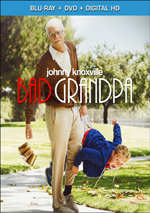 Johnny Knoxville boasts some talent, but he needs to leave his Jackass days in the past.